Once again it is summertime in America’s finest city, and many San Diegans clamor to spend time outdoors enjoying the many attractions this fair city offers. Unique to San Diego is the world- famous San Diego Zoo, which got its start in the Gaslamp in the historic Granger Building. When Ralph Granger arrived in San Diego in 1892, he was already a millionaire. He had grubstaked two German miners in Colorado, and they, in turn, repaid him by discovering the Last Chance Silver Mine. All three men made a fortune from the Last Chance. Granger, who had expanded his earnings into further mining interests, the cattle business and lumber holdings, disposed of all his holdings in 1891, and moved to San Diego. When he settled in, he built a home in Paradise Valley, which is now National City. Additionally, he built an impressive music hall, which housed one of the world’s finest collections of violins and a pipe organ. Unfortunately, Granger’s mansion burned down in 1906, but the music hall is still standing. It has deteriorated badly as it has not been used for over ten years, but plans have been made to restore it and continue to use it as a venue for weddings, parties and civic functions. The structure will also be moved to the Chula Vista Marina district, as the area where it now stands has also fallen into disrepair. Granger’s granddaughter-in-law, Oma, lived next door to the hall for many years and was very fond of the structure. 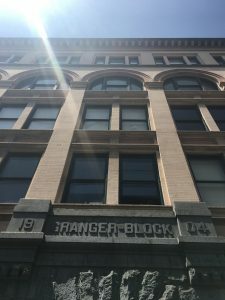 In 1904, Mr. Granger set his sights on the ever-expanding downtown San Diego area, and selected William Quayle, one of the city’s outstanding architects, to design an elaborate office building. The Romanesque style structure, built for $125,000, was steel framed and constructed of pressed bricks. It is five stories high and features embossed metal ceilings, gas lights and a manually operated elevator. The roofline, as was the custom, is an elaborately molded design supported by lentils, and the symmetrically spaced windows are twelve feet high. 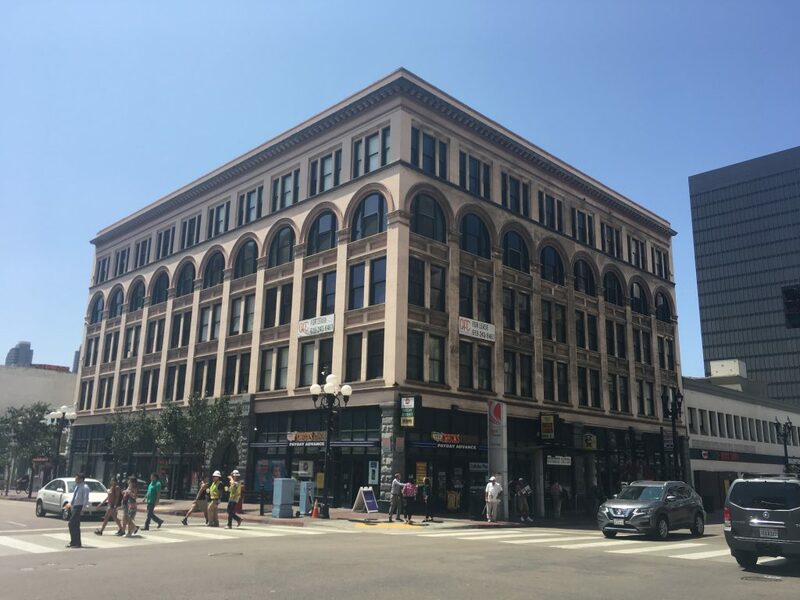 The third-floor windows are very decorative and offer an architectural focus as they are curved on the upper side and contrast with the rectangular windows on the other floors. The interior first floor, which was first occupied by the Merchant’s National Bank, features a recessed granite entrance, mosaic floors, marble front vaults and mahogany and onyx furnishings. Granger was the first vice- president of the bank, and U.S. Grant, Jr. was the initial director. In 1924, the bank became the Bank of Italy, the forerunner of the Bank of America. The Bank of America adopted its name in 1930. Throughout its existence, the Granger Building has had a variety of well-known tenants, none more so than Dr. Harry Wegeforth. Wegeforth was born in Baltimore, one of seven children born to Conrad Wegefarth (original spelling) and his third wife. He additionally had six older half-brothers from his father’s previous marriages. As a child, Harry always had an interest in both animals and tightrope walking. Indeed, after watching circus performers he began practicing, and became so adept at his high wire skills that he went on tour with the circus. Much to his dismay, he was fetched home by his brother, Charles. He then followed his older brothers into the study of medicine. He earned a position with the Baltimore Health Department at the age of fifteen. Unfortunately, a year later, Harry contracted influenza, which later developed into tuberculosis. On the advice of one of his many brothers, he moved to Colorado for his respiratory health, and herded Texas longhorns, while completing his high school education. He returned to Baltimore, enrolled in Baltimore Medical College, earned his Doctor of Medicine degree in 1906, and completed his post-graduate training, specializing in surgery, at Johns Hopkins University. He then became the first surgeon of the Baltimore Northeastern Dispensary. Ever restless, he left Baltimore in 1908 and went in search of a place to open his medical practice. Harry selected the fair city of San Diego to settle in, and easily passed the California State Board of Medicine Examinations. He then borrowed $50 and set up his offices in the Granger Building. Dr. Wegeforth was appointed president of the City Board of Health in 1912, where he launched a drive to improve the quality of the city’s food by advocating for the purification of milk and foodstuffs and bacteria tests for food suppliers. In 1913, Harry married Granger’s daughter, Rachel, and also changed the spelling of his name. His brothers, Paul and Arthur, followed Harry to San Diego and joined his practice. Drs. Paul and Harry Wegeforth served as surgeons during the second year of the Panama-California Exposition of 1915, and Harry also held a position on the Exposition’s Board of Directors. It was at this time, that he had the idea of starting a zoo with the exotic animals left after the closing of the Expo. He became inspired while he and Paul were driving down Sixth Avenue on their way back from performing surgery at Saint Joseph’s Hospital (later Mercy Hospital). Harry heard the roar of the lions from the Expo, and proposed the idea to Paul, who was very supportive. The two brothers, joined by Drs. Fred Baker and Joseph Chessman Thompson and naturalist, Frank Stephens, executed and filed the Articles of Incorporation and by-laws for the Zoological Society of San Diego on December 11, 1916. The fledgling zoo, now a world-wide zoological and botanical icon, originally consisted of lions, bears, ducks, lynxes, golden eagles, a badger, a grey fox, a coyote, a whip snake, a white goose, and groups of buffalo, deer and elk. The new zoo was facing financial problems by 1917, so Wegeforth organized a field and track meet between the Navy and Marine Corps to raise revenue to keep the zoo going. Ultimately, he came to an agreement with the City of San Diego in which they would own all the animals, equipment and property, but the Zoological Society would have exclusive jurisdiction over the care and management of the animals. Harry then resigned from the Board of Directors, and was replaced by Joseph Sefton, Jr. In January 1919, he resumed his position as president of the Zoological Society, after serving a short stint in the Army Medical Corps. Dr. Wegeforth then began a vigorous campaign to expand and re-design the zoo, networking, collecting and trading animals with other zoos. He kept the baby animals and some of his new acquisitions in the basement of the Granger Building, while their new quarters were being readied! 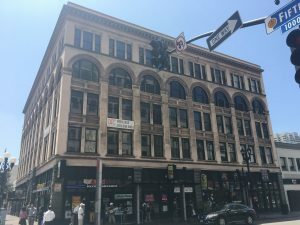 Other notable tenants of the Granger building were Benjamin Squire and Joseph Jessop and Sons. Squire established the Merchant’s Patrol and Fire Dispatch in the building and ran San Diego’s first private security patrol until 1940, when he retired. However, he came out of retirement to become the Granger Building’s infamous elevator operator, Uncle Ben. He finally retired from that job in 1955. Joseph Jessop came to sunny San Diego from England for his health. He failed at farming, and in 1891, started to work in the watch repair business. J. Jessop and Sons were tenants of the Granger from 1922-1928. By 1960, the family was one of the five largest privately-owned jewelry retailers in the United States. One last Granger tenant of note was C. Arnholt Smith, banker, business tycoon, owner of the Pacific Coast minor league Padres, and good friend of President Richard Nixon. After numerous successes and failures, Mr. Smith was convicted of exceeding legal limits on bad loans to his companies from the bank he founded, the United States National Bank of San Diego. He additionally owed the IRS $23 million in back taxes. He started his initial business in the Granger and kept his money in the safe in the basement. He served 8 months in a minimum security work furlough facility and was released early due to poor health. Mr. Smith passed away in 1996. Other tenants have been prominent attorneys, dentists and business professionals. Today, the ground floor houses a pizza restaurant and the upper floors feature executive offices and suites. 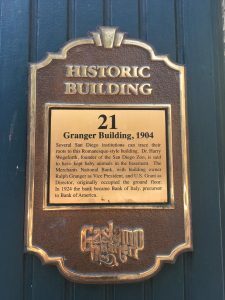 Learn more about the history of the Gaslamp by taking a historical walking tour with the Gaslamp Quarter Historical Foundation every Thursday at 1pm and Saturday at 11am. 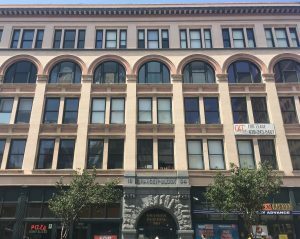 Gaslamp Landmarks is published monthly in the Downtown News, pick up your copy the first Friday of the month to be the first to read the article! This entry was posted in Landmarks. Bookmark the permalink.